Nakhon Phanon University was founded by merging local educational institutions in Nakhon Phanom Province under the “2005 Nakhon Phanom University Statute”, declared in the Thai Government Gazette No. 122, Section 75, on September 1st, 2005. 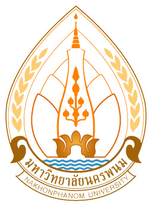 As a result, the institution has been officially called “Nakhon Phanom University” since September 2nd, 2005. Nakhon Phanom University is both a legal entity and government sector, operating under the Office of Higher Education Commission. The University differs from other new established universities. The combined institutions are centralised and standardised, following the University frameworks and standards. As such, the University is able to provide a broad range of trainings and educational programs from vocational, higher vocational, undergraduate to graduate levels. Promote integrated-development and -share of technology and knowledge, that meet the society’s needs and raise the GMS competitiveness, by means of research and development (R&D). Make the knowledge and scholarly expertise created and preserved at the University accessible to the citizens of the society, the nation, and the GMS. Promote and centralise cultural transmission at the national and the GMS levels. Governs the institution well by employing the Principle of Good Governance.